Venetian painting in its prime differs altogether in character from that of every other part of Italy. 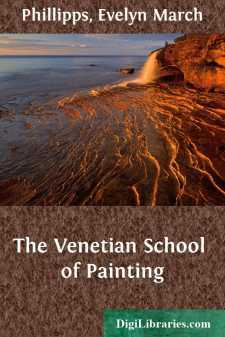 The Venetian is the most marked and recognisable of all the schools; its singularity is such that a novice in art can easily, in a miscellaneous collection, sort out the works belonging to it, and added to this unique character is the position it occupies in the domain of art. Venice alone of Italian States can boast an epoch of art comparable in originality and splendour to that of her great Florentine rival; an epoch which is to be classed among the great art manifestations of the world, which has exerted, and continues to exert, incalculable power over painting, and which is the inspiration as well as the despair of those who try to master its secret. The other schools of Italy, with all their superficial varieties of treatment and feeling, depended for their very life upon the extent to which they were able to imbibe the Florentine influence. Siena rejected that strength and perished; Venice bided her time and suddenly struck out on independent lines, achieving a magnificent victory. Art in Florence made a strictly logical progress. As civilisation awoke in the old Latin race, it went back in every domain of learning to the rich subsoil which still underlay the ruin and the alien structures left by the long barbaric dominion, for the Italian in his darkest hour had never been a barbarian; and as the mind was once more roused to conscious life, Florence entered readily upon that great intellectual movement which she was destined to lead. Her cast of thought was, from the first, realistic and scientific. Its whole endeavour was to know the truth, to weigh evidences, to elaborate experiments, to see things as they really were; and when she reached the point at which art was ready to speak, we find that the governing motive of her language was this same predilection for reality, and it was with this meaning that her typical artists found a voice. No artist ever sought for truth, both physical and spiritual, more resolutely than Giotto, and none ever spoke more distinctly the mind of his age and country; and as one generation follows another, art in Tuscany becomes more and more closely allied to the intellectual movement. The scientific predilection for form, for the representation of things as they really are, characterises not Florentine painting alone, but the whole of Florentine art. It is an art of contributions and discoveries, marked, it is needless to say, at every step by dominating personalities, positively as well as relatively great, but with each member consciously absorbed in “going one better” than his predecessors, in solving problems and in mastering methods. Florentine art is the outcome of Florentine life and thought. It is part of the definite clear-cut view of thought and reason, of that exactitude of apprehension towards which the whole Florentine mind was bent, and the lesser tributaries, as they flowed towards her, formed themselves on her pattern and worked upon the same lines, so that they have a certain general resemblance, and their excellence is in proportion to the thoroughness with which they have learned their lesson.